Over the past year, the Scottsh government has been very keen to celebrate its decision to increase the income up to which it provides maximum grant. I’ve been critical of this line, because it obscures the fact that the celebrated increase simply reverses most of the cut made by the same people in 2013. Up to 2012-13, a maximum grant was available at household incomes below £19,300. In 2013-14 that was cut to £17,000. Even leaving aside that £19,300 in 2012-13 would now be somewhere above £20,000, the most recent increase isn’t therefore much to boast about. It’s like standing hard on someone’s foot and then expecting them to be grateful when after a while you stand on it a bit less hard. The reason for highlighting this is not just as a failure of honesty in government communications (though that is part of it), but because the change in 2013 had such a serious negative impact on individuals. As the line quoted above shows, for the first time we can now say with some certainty how many. The way the figures have been presented (nothing dubious, just how it’s been done) have made it impossible to identify until now how many people fell into the £17,000-£19,300 band. 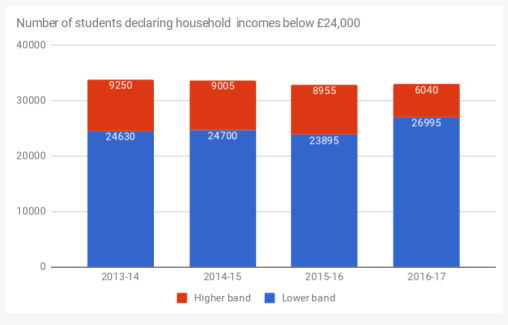 This year, however, we can quantify the numbers with incomes up to £19,000 and we can compare that with earlier years, when the cut-off was lower. On the basis of these numbers, the SG’s 3,000 looks like a fair estimate of the number caught by the threshold cut in 2013-14 (or a bit of an under-estimate, bearing in mind the new limit is still below the old one). The changes, down and up, have been applied to everyone, new and continuing. The original move probably saved the Scottish government around £4m a year in 2013-14 and 2014-15, and slightly less in 2015-16, when £125 was added to the grant, reducing the saving by around 10%. Other data suggest it is likely most of those affected were younger students, eligible for YSB. In 2012-13, every young student with a household income up to £19,300 was entitled to a grant of £2,640. If they chose, they could top that up with a loan of £3,740 to a total sum of £6,380 (living away from home; a lower loan was available to those living at home). I think a real injustice was done to the people in this group, who experienced a clear, significant detriment. In regarding this as an acceptable penalty to apply to this small, vulnerable group, the government did an archetypally bad bit of policy-making. In throwing its whole weight uncritically behind the 2013 changes (then: they no longer do) and not even insisting on a safety net for those already studying, NUS Scotland performed poorly. Lucy Hunter Blackburn, a former civil servant and freelance researcher, is now a postgraduate researcher at the University of Edinburgh.